Sgt. 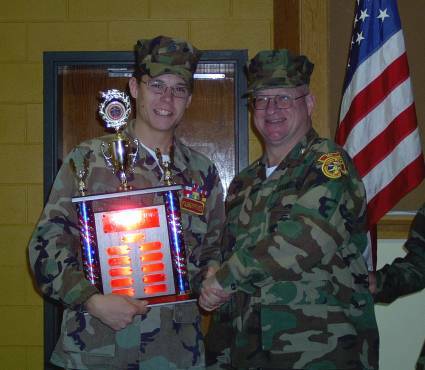 Bowman has earned the honorable distinction of being appointed the Tri-City Young Marine of the Year for 2007. Sgt. Bowman has stepped forward and shown steady and committed leadership through, at times, very distracting and disappointing events. 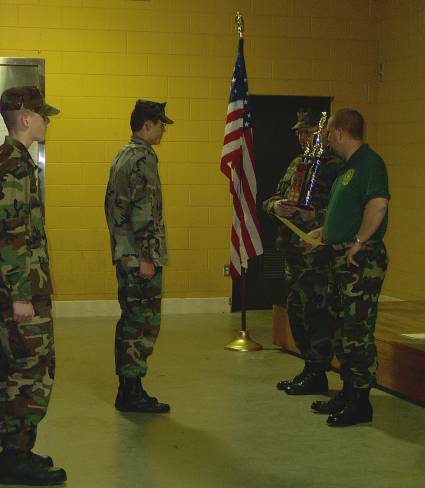 His participation and dedication to the growth of the Tri-City Young Marines is something to be held as an example for all other Young Marines to follow. 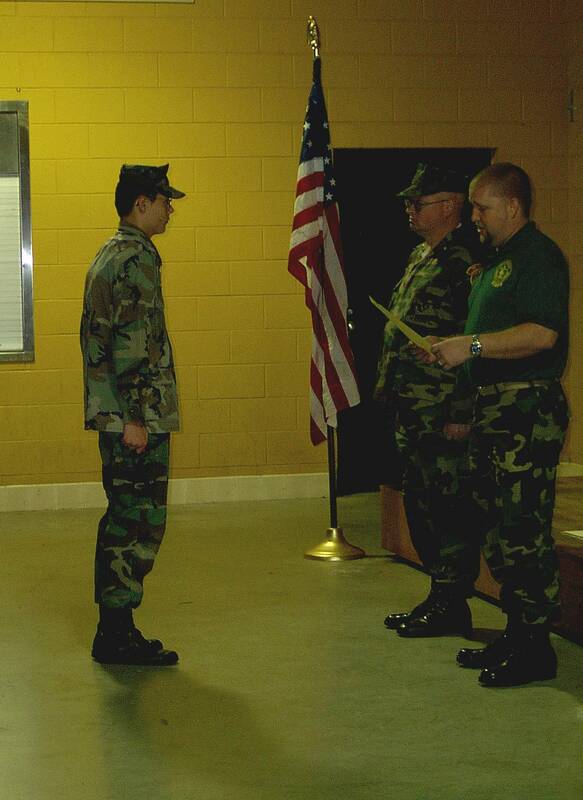 Young Marine Sgt. Bowman's positive attitude and willingness to take the initiative and get the job done, even with short notice, is a big asset to this Unit. Thank you, Young Marine Sgt. Bowman, for your commitment to your Commanding Officer, the Staff of the Tri-City Young Marines, and your fellow Young Marines! A very happy Sgt. Bowman learns he has achieved the great honor of Young Marine of the Year. XO Mr. Haeg and Mr. DeGraaf explaining the details regarding Sgt. Bowman's special award. 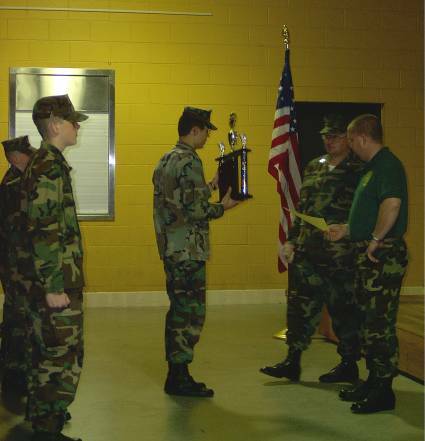 Presentation of the Young Marine of the Year Trophy. Sgt. Bowman will be added to the plaquard, where he has achieved a special place in the history of our Tri-City Young Marine Unit. OORAH SGT. BOWMAN! Sgt. 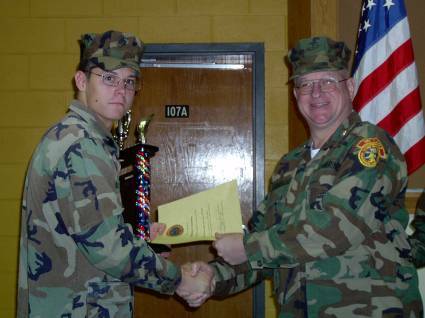 Bowman receiving congratulations from XO Mr. Haeg. Man, that Trophy sure does catch the light! Sgt. Bowman already is thinking of where he'll place this Trophy at home. Mr. Haeg took great joy in presenting this award to Sgt. Bowman. Young Marines and New Recruits..this gorgeous Trophy and the prestigue of having your name added to it, can be yours too. Reach for the stars, it'll get you much higher than you think!